American culture unapologetically romanticizes the lives of the first pioneers. Through rose-colored glasses, we see Manifest Destiny as fate, leading our heroic ancestors across a perfectly manicured landscape. In reality, the frontier was a terrifying, dangerous wilderness. And you were only as good as the tools you carried. Pioneers were responsible for clearing their own land, building their homes, defending themselves, sewing their own clothes, and hunting for their own food. And the devices and tools they brought with them—severely limited by weight and size—were vital lifelines to succeeding in all of those pursuits. So what were they? An allegorical depiction of "American progress" carries telegraph wire westward. Behind her, settlers follow with stagecoaches, conestoga wagons, and railroads, symbolizing the virtue of taming the western frontier. But in truth, such conveniences took decades to appear. This was the reality most settlers knew. A family in front of a typical sod house, in 1886, in Nebraska, Custer County. Instead of a plush toy the boy on the right is holding a young bull. Note the ornament high on the facade. Pioneers would make their own clothes, from shearing the wool and spinning it into thread, to actually weaving the fabric, and finally, fashioning it into a garment. A spinning wheel from the 1820s. The print below shows two women preparing supper on a small, portable stove—a relative luxury—in front of their tents, in 1866. "You need only one soap: Ivory soap," proclaims this ad from 1898, which shows a pioneer washing with a novelty—floating! soap, at his campsite. You can observe other household objects and tools in the background as well. Frontier utility knives: a butcher knife, a skinning knife, and a small antique paring knife. Farm kitchen cutlery and kitchenware. A grain reaper was a vital piece of agricultural machinery. Invented by Cyrus H. McCormick, of Virginia, in 1831, this contraption still serves as the basis for modern-day grain harvesting machines. A grain fanner, from the 1850s, would blow air through wheat to separate the chaff—an otherwise time-consuming task. This illustration from 1899 shows messengers warning settlers of a Native American uprising—but note the hand-operated plow and broad axe in the picture. Water crossings were another major danger, thanks to the crude ferries often used by early settlers. Here, people cross the Red River, in Texas, during a flood in 1874. 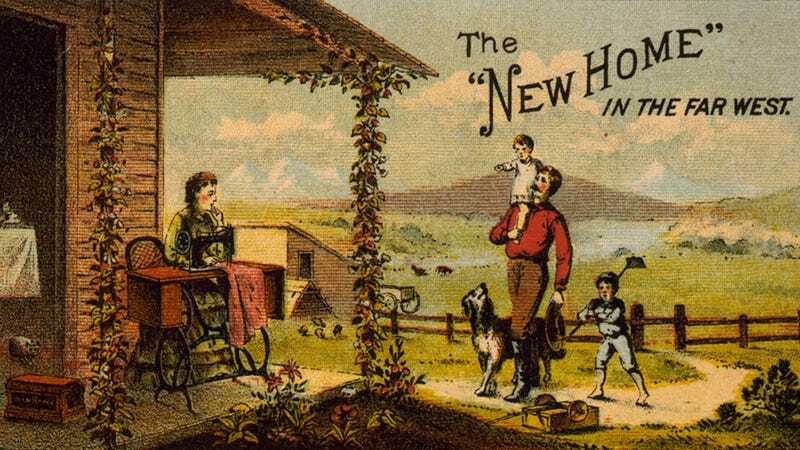 By the late 19th century, families were more established. Here, we see a family standing in front of sod house with a windmill—a fairly high-tech detail—inCoburg, Nebraska in 1884. This apple crusher and cider press was also high-tech, for its time. Some settlers were lucky enough to have brought cast iron stoves from back east—like this one, from the 1820s. A carving bench let craftsmen whittle and carve comfortably. Theft was common, too. This lambskin money vest, from 1853, was designed to (theoretically) protect a settler's valuables. The vest has three rows of button pockets for holding gold and silver coins, the medium of exchange in California.